Simco-Ion’s Aerostat® line of products provide ionization protection for a variety of environments including assembly, electronics, and cleanroom applications. You’ll find a complete line of Aerostat ionizers and related items at QSource.com. Simco-Ion’s reliable Aerostat FPD Series Overhead Air Ionizers control ESD in assembly and electronics manufacturing environments that require steady operation and extraordinarily fast discharge time and performance. These simple-to-use ionizing devices feature high-output/high-velocity fans and intrinsically balanced ionization. For more information about the Aerostat FPD Series, please click here. 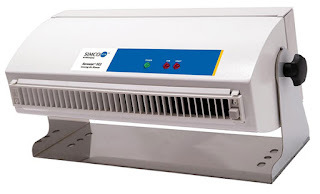 The Simco-Ion Aerostat Guardian Series Overhead Ionizing Blower and CR2000 Cleanroom-Rated Overhead Ionizing Blowers offer superior ESD decay over the work surface area for protection of sensitive components and are inherently balanced to 0 ±5V. The cleanroom versions are Class 10 compatible and are for use with critical cleanroom applications. For more information about the Aerostat Guardian Series, please click here. 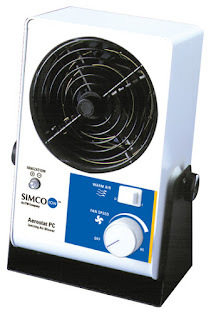 Simco-Ion’s lightweight, compact Aerostat PC Ionizing Air Blowers create localized ESD decay coverage. These quietly efficient units are perfect for eliminating ESD during production processes. The Aerostat PC Ionizer features a discharge time of 1.5 seconds, and was designed for direct targeting of the ionization. For more information about the Aerostat PC Series, please click here. Simco-Ion’s Aerostat XC Extended Coverage Ionizing Blower is used in electronics and medical assembly environments to provide balanced coverage and stability for rapid ESD decay across a wide 3’ by 6’ area. The Aerostat XC is inherently balanced to 0 ±5V and uses AC technology to protect sensitive electronic components. For more information about the Aerostat XC Extended Coverage Ionizing Blower, please click here. Simco-Ion’s Aerostat XC2 Extended Coverage Ionizing Blower provides long-term static management for electronic, semi-conductor, flat-panel display, and medical assembly work environments. This easy-to-use device was designed for extremely fast static-charge neutralization, never needs calibration, can be monitored locally (with alarm LEDs) or remotely (Facility Monitoring System (FMS)), and has a built-in emitter cleaner. For more information about the Aerostat XC2 Extended Coverage Ionizing Blower, please click here. For assistance with choosing the correct Aerostat product for your application, please contact one of our Q Source experts at 800-966-6020 or via qsales@qsource.com. To purchase a Simco-Ion Aerostat ionizing product, please select the specific model and visit its product page at QSource.com. We also offer a complete line of other Simco-Ion products.